The fully redesigned Cayenne has been recently launched but certain second-generation models such as the popular GTS carry on into 2018. Seeing as it is a runout model, not much has changed for this model year although it does undercut the new Cayenne price wise and the full range of Porsche customizations and extras are all on offer. Whereas the first-generation Cayenne was roundly criticized for its challenging exterior looks and somewhat haphazard interior layout, the second-generation model was a major improvement in all areas. This sporty GTS model in particular comes fitted with unique interior details like suede seat inserts and headliner as well as some very comfortable powered sport seats. The once cutting-edge dashboard and cockpit design is looking a little dated compared to the competition as well as the latest Cayenne, however it has benefitted from a recently updated infotainment system and all the controls are logically laid out, even if there are a few too many buttons around the gear lever. The need to put the key into a physical slot really does betray this models age though. The Cayenne is not the most generously sized SUV around and the rear passengers may not find the upright backrest all that comfortable on longer trips. The cargo area too is a bit smaller than you would find in this segment. Ever since its inception, the Cayenne has been the benchmark in terms of handling dynamics and driver involvement. The slightly newer BMW X5 does cut it close but once you add the air suspension, active suspension management and automatic brake differential that are all standard on the GTS, you get a hefty SUV that acts like a much smaller and nimbler sports car on twisty roads. In true Porsche tradition, the brakes are also well up to the task of hauling the GTS down from silly speeds, the steering feels accurate too and the adjustable dampers can be set to either soak up the bumps or keep the car planted and level during enthusiastic driving. 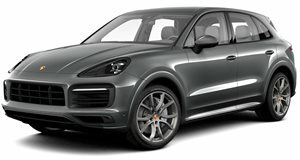 The Cayenne GTS is equipped with a 3.6-liter twin-turbocharged V6, pushing out 440 horsepower and 443 lb-ft of torque to all four wheels, it provides strong acceleration throughout the rev range. Fans of the old GTS may remember the burbly 4.8-liter V8 that lurked under its hood but this turbo unit will leave it in the dust away from the lights and the modern 8-speed Tiptronic automatic transmission is also a far smoother and quicker shifting unit. Expect a 0-60 mph time of around 5-seconds. While the performance is impressive it does come accompanied with pretty steep consumption figures as well, city driving will get you 16 mpg while a highway run is rated at 23 mpg. This is about average for the class but it is worth noting that the new generation Cayenne is slightly less thirsty. The GTS comes relatively well-equipped as standard and some of the more notable features include an upgraded 7-inch infotainment system incorporating Bluetooth audio streaming and navigation, surround parking sensors, LED exterior lights and a 10-speaker audio system. Some GTS specific items include 8-way powered front sport seats with memory function, sports exhaust, larger brakes, tuned air suspension, leather/suede interior and 20-inch alloy wheels. Standard safety systems are limited to the various traction control systems and brace of airbags so you will have to pay up for the more advanced driver aids. A Premium Package Plus adds a panoramic sunroof, seat heating, upgraded front seats, auto-dimming mirrors, park assist, comfort lighting package and lane change assist. Individual performance options include ceramic composite brakes, torque vectoring Plus and dynamic chassis control. There are also many colors, alloy wheels and interior details to choose from. The second-generation Cayenne GTS may not be the newest SUV on the block but it still offers a level of performance and refinement that matches up very well to the newer competition. Recent infotainment updates and a superb engine/transmission combination also help keep it competitive although you will have to pay extra if you want advanced safety systems. Yes, the latest Cayenne is already on sale but it does come at a price premium and the range does not include a GTS variant yet, so be sure to include this model on your shortlist.